One of the coolest parts of being an old boy, on the outside looking in, is hindsight. This past weekend I took Mira up to Brentwood College School to enjoy the 39th Brentwood Regatta with me. It was great, the sun was out, the races were running, and we saw so many old faces. One of the standouts was Captain Marco Rusconi, Class of 1997, currently flying with the Snowbirds. I was asked to hand out a few awards at the regatta, and I laughingly passed the honour onto Marco, as a Snowbirds pilot trumps an Olympic Silver Medalist any day. Way to go Marco! It wasn’t until Saturday afternoon that I realized even I fell into the trap of being distracted. 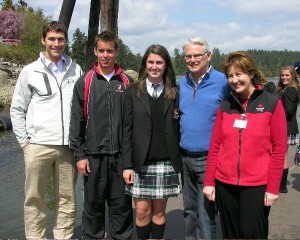 BC Premier Gordon Campbell made a quick campaign stop at the regatta to say hello and shake a few hands – the school kindly asked me to help host him. As we were walking around having a quiet, personal conversation, him, me and his entourage of supporters, staff, film crews and photographers, Tony and Yvonne Carr redirected my attention to what would have been my ONLY focus 13 years earlier when I was attending the school – the Boy’s Junior A School 8+ Final (Race 66, Event 11). Oddly, the entourage moved on even though I stopped and turned my attention to the race. This race was the key race of the regatta, and it was shaping up to be a great race between the two rivals Brentwood College School and Shawnigan Lake School. 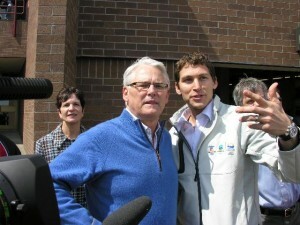 If the Premier was going to be there for the race, I sure as hell wasn’t going to let him accidentally have his back to it! At risk of his security detail tackling me, I ran up after him calling “Premier, Premier – look at the race course!” as I fought through the camera crews and Liberal Party Loyalists. As I explained the significance of the race to the Premier the Brentwood boys started their sprint! Shawnigan Lake, having led the entire way down the course, fought hard to prevent Brentwood from sprinting through them, but to no avail. Brentwood rowed through them right before the eyes of the Premier. What a great race for the Premier to be on the regatta site, and what a great finish to highlight how exciting a good rowing race can be. Good job to all 18 athletes from both crews for putting so much blood, sweat and tears into that race. I know it must be hard for those Shawnigan boys and amazing for the Brentwood kids, but trust me, win or lose, you all will remember this race fondly 13 years from now.